Saturday may go down as one of the most important dates in the burgeoning relationship between Roberto Martinez and Everton. If early impressions had left some supporters unimpressed, Martinez will have surely won over many of the doubters on Saturday as he out thought and out witted “The Special One” on a special evening at Goodison Park. At the full-time whistle, the Goodison crowd rose as one, to shout and sing their approval and applaud Roberto’s fighters from the pitch. Martinez has been true to his word, he promised he would bring a finesse to Goodison, a return of the “School of Science” philosophy, that Evertonians of a certain generation hold dear to their hearts. But in doing so, he promised not to forget the virtues that have made Everton regular competitors in the top seven of the Premier League for much of the last decade under David Moyes. Saturday proved many doubters wrong. Everton will not abandon the ethics that make Goodison one of the most difficult places for opposition teams to play football. Hardwork, determination, blood, sweat and tears, they all remain essential ingredients of an Everton player, however Martinez is looking to add sophistication, skill and entertainment to the mix, as he looks to propel Everton from nearly men, to glory boys. But despite the brilliant win, Martinez refused to get carried away. He knew that on another day, Chelsea would have made Everton pay for the carelessness in defence that almost gifted Chelsea the most simple of goals. He was also aware that mistakes in midfield will need to erased if Everton are to win regularly against the financial super powers of English football. Football isn’t won on statistics alone, the first three games had proven that, but the Blues must increase their possession percentage against the big boys if they are to push on towards the golden gates of the Champions League. If Roberto started to win over the doubters, so too did a number of his players. Steven Naismith had endured a terrible time at Everton to date, derided by the fans and unable to secure a regular starting spot, he could have been forgiven if he had looked for an immediate return North of the boarder in the summer. But the Scot has a new lease of life under Martinez. Buoyed by an impressive pre-season, Naismith capped his first start of the new campaign with a hardworking performance, topped with the winning goal and a standing ovation from the Goodison crowd. Gareth Barry, another to attract a number of naysayers before he had even kicked a ball, produced a dream debut performance, making him an instant darling of the Everton crowd. Composed in possession, tough in the tackle and quick to close the opposition down, Barry optimised everything Martinez is looking for in his midfield. It is no wonder that Everton’s Spanish manager called Barry’s performance a “master-class”. Why on earth have Manchester City let him go? City’s loss is Everton’s gain and on this form, Barry will be earning himself a permanent Everton contract in the summer, as well as joining the growing Everton contingent on the England plane to Brazil for the 2014 World Cup. But despite the optimism, it was actually Chelsea who dominated large parts of Saturday’s game. Through a mixture of good fortune, fantastic defending and poor finishing, Everton somehow looked destined to enter half time with the scores level. However, on the stoke of half-time it was the Blues who broke the deadlock. Ross Barkley, used his fabulous balance to turn the Chelsea defence this way and that and such is the brilliance of Barkley, defenders are drawn towards him. The eccentric David Luiz needlessly rushed to close him down, but as he did, Barkley switched the ball wide to Osman, sensing that Chelsea were now short of numbers in a central area. Osman’s cross was actually over hit, but Jelavic, unable to score himself, directed a header back across goal for Steven Naismith to head home the simplest of opportunities. From there on, it promised to be an edge of the seat encounter. Chelsea spurred on by the frustrated Mourinho, came out of the second half on fire. Everton however weathered the storm and when Chelsea made attacking changes in search of the crucial equaliser, it was actually Everton who pushed forward and attacked. Barkley and Mirallas in particular, were electric, taking advantage of the space in the Chelsea defence to torment a fractious back line. 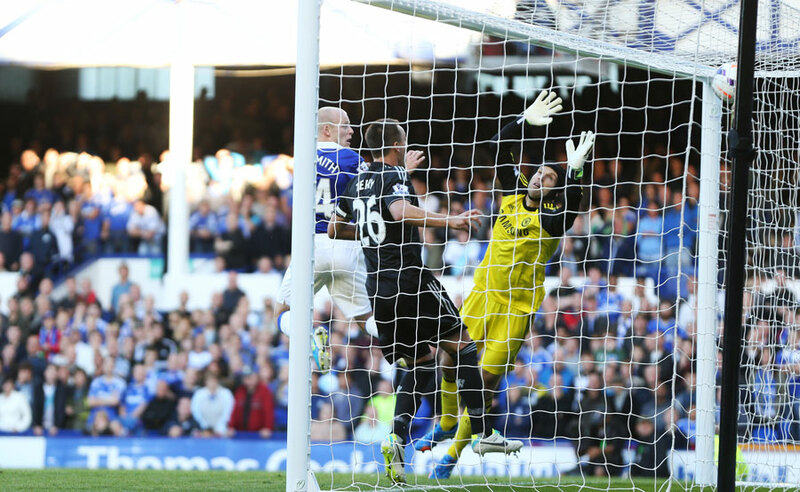 Mirallas and Baines both went close with free-kicks, with the latter striking the crossbar with a brilliant effort that left Cech stranded in the Chelsea goal. Mirallas too, brought a good save from the Czech keeper, cutting inside from the left, before unleashing a power right footed strike, that was parried away to safety. Athough Chelsea continued to huff and puff, they lacked any end product and it was no surprise that Everton held out for a first league victory under Roberto Martinez. All of a sudden an average start looks half decent, with the Blues only one of two unbeaten teams in the league. Everton will travel to London next weekend in high spirits as they look to build the momentum with a win over West Ham.